Trish at Love, Laughter, and a Touch of Insanity is hosting her 2nd annual “A Day in the Life” series, where bloggers share a normal day outside of writing about books on their blogs. This is my Friday, March 11, 2016. First up, I had a normal workday. Here’s (one side) of my office—two screens means business, people! I keep it pretty colorful and busy on the walls, though. I have original art mixed with concert posters, painting poster-size prints, calendars, and a photo collage of family and my babies (niece and nephew) to get me through the day. Most of my job in the marketing department consists of making the printed programs for our music school’s recitals and concerts, and managing the social media. My office is adjacent to the large ensemble rehearsal room, so on Friday I would have heard conducting class, Wind Ensemble, Orchestra, and one of the jazz bands have class and rehearsal all day. It’s a normal soundtrack to my days. People seem to be split—either they don’t know how I get any work done with the constant action and “noise,” others think it’s super cool to hear live music all day long. It’s a little bit of both for me, but by and large I like the students being around and hearing rehearsals. I’m so used it that when I try to work at home I usually need to put on records or TV in the background! I had a couple of errands to run after work. 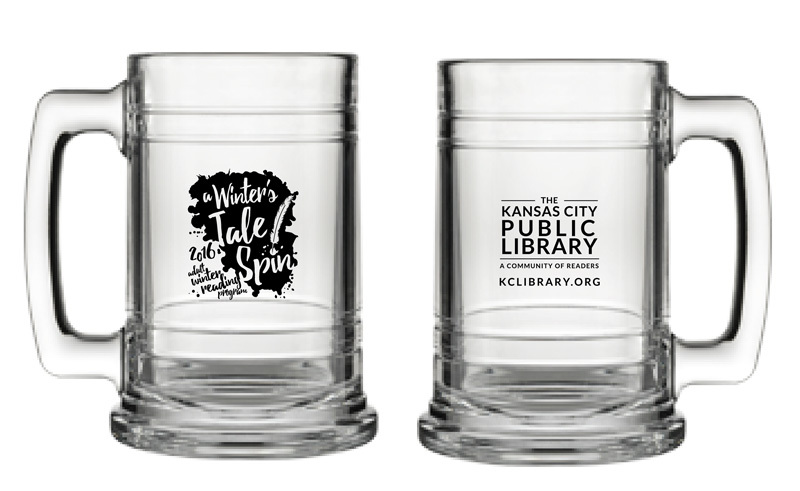 First, I submitted my completed challenge form to the KC Library, which has an adult reading program at the beginning of each year: read five books between January and March. 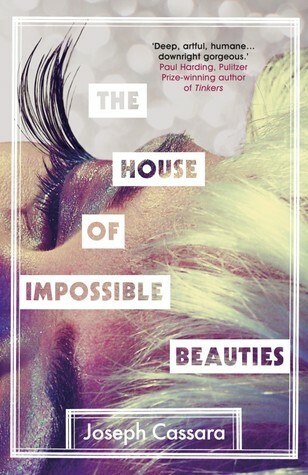 There’s always a theme with suggested books on that theme, but you can read any five books and it counts. If you complete the challenge, you get a piece of awesome glassware (coffee mugs and an old fashioned glass in the past). This year I got a beer stein! Pic on the left above is the book circle sculpture at the entrance to the Plaza Branch. After the library I swung by our favorite local vinyl shop, Mills Record Company in Westport, to pick up a record that I had on order that came in (Galactic’s Into the Deep). Of course while I was there I picked up another couple of records… Esperanza Spalding’s new one and The Band’s The Band. After these errands, I went over to P. Ott’s, a dive bar on the Plaza, where my husband and our friends were already celebrating one of our friend’s passing his dissertation defense that afternoon. We’re not a picture-taking group really, but I remembered to snap this one pic of a poster on the wall of the bar on my way out. I left the party early because I was assigned to review the Alicia Olatuja Quintet at the historic Folly Theater in downtown Kansas City on its Folly Jazz Series. I love the Folly, it’s one of my favorite Kansas City venues. After the concert, I went BACK to P. Ott’s to rejoin the party! Nick and I were there until… I’m not even sure. After midnight, I think. I didn’t even read anything all day. Pretty typical! This happened the next day (Saturday, March 12), but I thought I’d sneak it in this post since it’s a normal thing in my life! Saturday night I played a gig with one of my orchestras, Heritage Philharmonic, out in Blue Springs. We played Vaughan Williams’s Five Variants of “Dives and Lazarus” and Holst’s St. Paul’s Suite for String Orchestra. (There was more on the concert, played by other sections of the orchestra.) This is a selfie I snapped backstage waiting to go on. Fun times! In the tradition of The Perfect Storm, Sudden Sea harkens back to a natural disaster that struck terror in the hearts of many. In this narrative, readers experience the Great Hurricane of 1938, the most financially destructive storm on record. There are many shocking things in Sudden Sea—starting with the fact that the New Englanders were denied an accurate forecast (the word “hurricane” was omitted from many storm warning reports). There are several harrowing experiences endured by the survivors and victims, not least of which is the haunting account of a bus full of children trying to get home from school during the height of the storm. Scotti’s writing style is pithy, but not lacking graceful notes which really brought the horrifying experience of this storm to life as you read. The matter-of-fact descriptions of the way the ocean water was relentless penetration and ruthless destruction of everything in its path. People hoping for a “friendly mattress” to float by, their attic floors to become rafts, fearing normal everyday objects suddenly transformed into deadly projectiles because of the gale-force winds, and more. It’s hard to think about a person innocently stepping outside their door to take a peek at the weather and disappearing in a split second. Sudden Sea reads like an action novel, but is more impactful because it is a non-fiction. I did really enjoy the book, and it was a quick read for me (don’t let my 2.5 week time frame fool you—I just took breaks and read other stuff in between). It brings up lots of discussion points about the stoic grit of the Great Depression-era people, survival decisions in general, why do we choose where we live and build, and weather forecasting and its alert system. 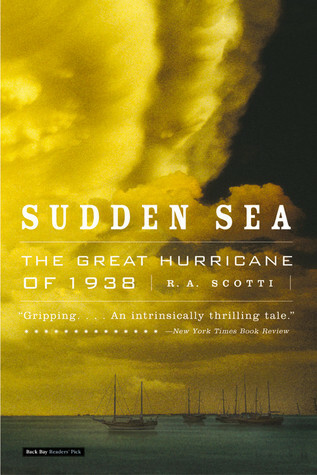 Sudden Sea is a great read for those interested in New England history and natural disasters. Our read of this was also kind of timely, considering the recent typhoon in the Philippines and Hurricane Sandy in the United States last year. Sudden Sea was published in 2003, just two years before Hurricane Katrina struck New Orleans. Read from December 4 to 21, 2013. Charles Portis has long been acclaimed as one of America’s foremost writers. True Grit, his most famous novel, was first published in 1968, and became the basis for the movie starring John Wayne. True Grit tells the story of Mattie Ross, who is just fourteen years of age when a coward going by the name of Tom Chaney shoots her father down in Fort Smith, Arkansas, and robs him of his life, his horse, and $150 in cash. Mattie leaves home to avenge her father’s blood. With the one-eyed Rooster Cogburn, the meanest available U.S. Marshal, by her side, Mattie pursues the homicide into Indian Territory. I was really excited to be a part of the Big Read this year—I missed it last time around (and it was Tom Sawyer anyway; I’ve already read that). True Grit was out of my comfort zone, since I’d never read a Western before—it’s just not a genre that captures my interest much. However, True Grit protagonists Mattie Ross and Rooster Cogburn certainly captured my attention. I was repeatedly shocked and awed by Mattie’s audacity, confidence, and, well, her true grit. I mean, a 14-year-old chasing down her father’s murderer? Cunningly negotiating the price of ponies and services? Ruthlessly dealing with dangerous, grown adult strangers miles and miles away from home? Wow. She had real mettle and quickly became one of my favorite fictional characters. Rooster Cogburn, the marshal Mattie enlists to help her find Chaney, was quite the character himself, too. Now, I did see the 2010 Coen Brothers film with Jeff Bridges in the role before reading the book, and I love Jeff Bridges, so I had trouble not visualizing him in my mind while reading True Grit. But I thought Cogburn, for all his stubborn orneriness, had a caring underbelly in his own way—how he didn’t ditch Mattie no matter how stubborn and ornery she could be! 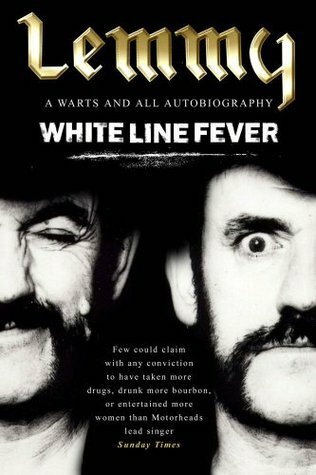 Another thing I loved about the book was how humorous it is, which took me by surprise. Not a comedy per se, but several times throughout Mattie will relate a a memory of this long-ago adventure that was just absurd and hilarious, like when Rooster decided to tell her his life story and it became so long-winded that Mattie dozed off, only for Rooster to nudge her awake again to keep talking to her, or when Mattie was vaguely remembering the romance novel she read to another hotel tenet at the beginning of the book, or the “Rat Writ” giving by Rooster to the varmint in his living quarters… and so on. Being a citizen of Kansas City, Missouri, it was also pretty great to catch references to local history like the Lawrence Massacre during the American Civil War and encountering Jesse James’s crew. I also liked that the action mostly took place in Arkansas and Oklahoma rather than Texas or further in the Southwest, like where you’d imagine most Westerns are set. As much as I did really enjoy True Grit, I still don’t think Westerns in general are for me and I’m not too interested in seeing the John Wayne film version, but I wouldn’t mind seeing the Coen Brothers one again in the future. But I definitely would recommend True Grit to anyone who likes adventure, spunky female leads, and unlikely partnerships. I’m part of the Stranger than Fiction book group at the KC Library, but for our discussion on True Grit we joined up with the FYI book group for a mega-group discussion, which was published in the Kansas City Star. Click here to read it! Read from October 4 to 19, 2013. Enter your email address to follow mylittleheartmelodies and receive notifications of new posts by email. All content on this blog Copyright © 2009–2018 Kristin Shafel (all rights reserved) unless otherwise noted. Please do not copy, share, or use my words, pictures, or music without permission. My Life. My Thoughts. My Words. My Way.